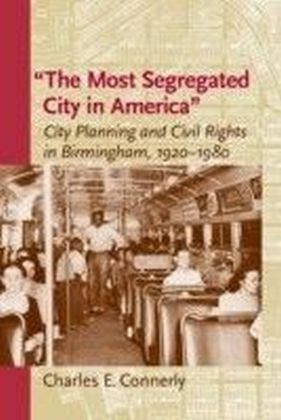 Most Segregated City in America"
One of Planetizen's Top Ten Books of 2006",Butfor Birmingham,", Fred Shuttleworth recalled President John F. Kennedy saying in June 1963 whenhe invited black leaders to meet with him, ",we would not be here today. ", Birmingham iswell known for its civil rights history, particularly for the violent white-on-blackbombings that occurred there in the 1960s, resulting in the city's nickname",Bombingham. ", What is less well known about Birmingham's racial history, however, isthe extent to which early city planning decisions influenced and prompted the city's civilrights protests. The first book-length work to analyze this connection, ",The MostSegregated City in America",: City Planning and Civil Rights in Birmingham, 1920-1980uncovers the impact of Birmingham's urban planning decisions on its black communities andreveals how these decisions led directly to the civil rights movement.Spanningover sixty years, Charles E. Connerly's study begins in the 1920s, when Birmingham used urbanplanning as an excuse to implement racial zoning laws, pointedly sidestepping the 1917 U.S. SupremeCourt Buchanan v. Warley decision that had struck down racial zoning. The result of this obstructionwas the South's longest-standing racial zoning law, which lasted from 1926 to 1951, whenit was redeclared unconstitutional by the U.S. Supreme Court. Despite the fact that AfricanAmericans constituted at least 38 percent of Birmingham's residents, they faced drasticlimitations to their freedom to choose where to live. When in the1940s they rebelled by attemptingto purchase homes in off-limit areas, their efforts were labeled as a challenge to cityplanning, resulting in government and court interventions that became violent. More than fiftybombings ensued between 1947 and 1966, becoming nationally publicized only in 1963, when four blackgirls were killed in the bombing of the Sixteenth Street Baptist Church.Connerlyeffectively uses Birmingham's history as an example to argue the importance of recognizing thelink that exists between city planning and civil rights. His demonstration of how Birmingham'srace-based planning legacy led to the confrontations that culminated in the city'sstruggle for civil rights provides a fresh lens on the history and future of urban planning, and itsrelation to race.